Vt. Steps Closer To Single-Payer Health Care Vermont is about to accomplish something the federal government couldn't. Once Gov. Peter Shumlin signs a bill on May 26, the state will be on track to having a single-payer health care system. He says the new system will treat health care as a right — and be a huge jobs creator. Vermont Gov. Peter Shumlin has only been in office since January, but he's already looking years ahead to what the state's health care system could look like. Vermont is about to accomplish something the federal government couldn't. Once Gov. 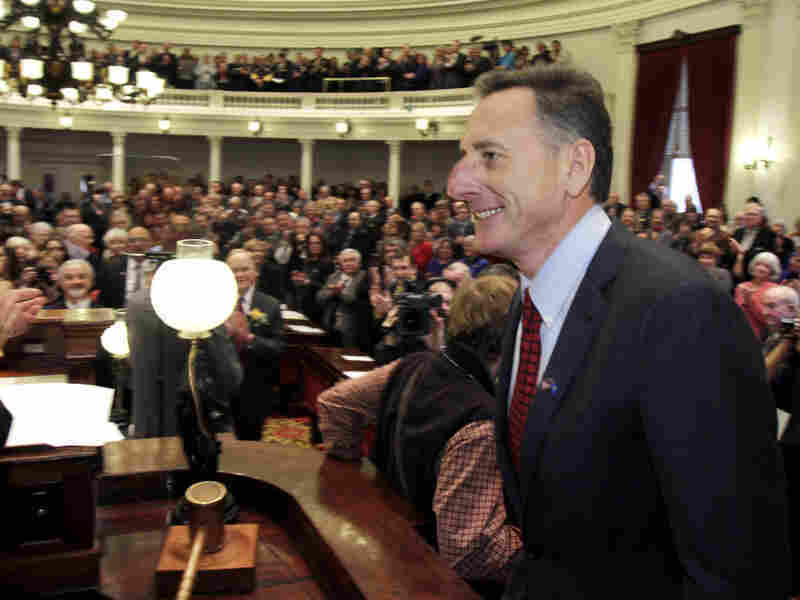 Peter Shumlin signs a bill on May 26, the state will be on track to having a single-payer health care system. "We're actually trying to design the first single-payer health care system for America," Shumlin told Guy Raz, host of weekends on All Things Considered. "Basically what our system will do is treat health care as a right and not a privilege," he says. "We want to design a system where health care will follow the individual, and not be a requirement of the employer, which we think will be a huge jobs creator." Most importantly, Shumlin says, it'll be a publicly financed system. Everyone pays, and the state uses those "health care dollars to make us healthier, not to enrich insurance companies, inefficiency, waste, and the current fee-for-service system, which bills providers based on how much service they do." But don't break out the Canada comparisons just yet. Vermonters aren't going to wake up to a single-payer system overnight. What's being passed is more of a framework. They are using the Affordable Care Act, the hotly contested bill passed last year by Congress, as a bridge for the state to get there. When that bill becomes law in 2014, so will Vermont's plan. The basic outline looks like this: The federal government, Vermont's state government and employers will all still pay in for health insurance. That money will then all flow through Green Mountain Care, Vermont's official health insurance. To equalize the rates consumers pay, the state will ask the federal government for Medicaid waivers. The state government must also court national employers that do business in Vermont to put their employees on Green Mountain Care. The bill doesn't lay out hard specifics on how to pay for it all, which has critics nervous. A financial exploratory committee has the task of putting together a proposal due January 2013, but for now Shumlin isn't worried. He says there are only a few different options to choose from in order to pay for a publicly financed system, like using Medicaid vouchers. The logistics will come in time, he says. Right now, the cost of health care is swelling and Shumlin believes setting Vermont up on a single-payer system will create a more sustainable way to take care of everybody. "We have a crisis," he says. "What I find alarming is that so many of us are willing to pretend that everything is going to be OK if we stick with the current system. So we're taking the bull by the horns up here in Vermont." If Vermont does get it right, it could see more businesses and jobs coming in. Shumlin sees this type of health insurance as a big financial ease for employers, especially small-business owners. That's a big economic incentive, but it wasn't enough to save the single-payer provision of the Affordable Care Act from being axed by Congress last year. Yet Vermont might be the right size and the right political environment to be a sandbox for a single-payer system in America, and Shumlin believes it could serve as a model for other states. "We want to figure this one out and get it right," Shumlin says, "Then we hope that perhaps others might follow."